Dubai, UAE, August 30, 2017: The new Etro collection is overflowing with that quintessentially Italian brand of elegance, with iconic designs and the finest artisanal expertise. The unmistakeable Paisley pattern is given a modern makeover courtesy of the most hi-tech materials around, with timeless colors and stunning details. The result is a triumph of tradition and innovation, proving that the brand’s creative spirit is conquering the world of eyewear, too. The dual acetate structure is enhanced by the frames’ rounded shape and the inclusion of the double bridge with gold metal profiling. This model is one of the stars of the catwalk and the brand’s latest advertising campaign. 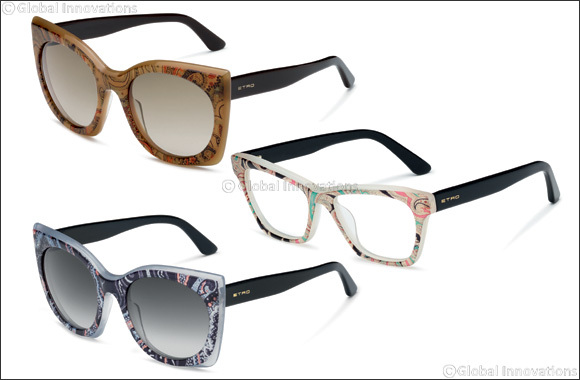 With its compact temples, the left-hand features the Etro logo. Look out for the version featuring black frames with the iconic Paisley pattern. Available in Black, Black Paisley, Green Olive/Black. The sophisticated butterfly shape of this model shows off the colorful nuances of the Paisley design. Adorned on the front section, the bold angles offset the rounded rims. The milling work on the sides – done by hand – creates an elegant contrast between the full color of the acetate and the sparkle of the opaline background. The colorful design of the front section is juxtaposed with the solid-color temples, with the Etro logo printed elegantly on the left temple. Available in Black Paisley, Brown Paisley, Petrol Green Paisley and Bordeaux Paisley. The simplicity of these aviator Woodstock frames shows the wealth of artisanal experience invested into creating them. Sleek metal interacts with luxurious, hand- stitched leather inserts which create stunning contrast around the lenses and double bridge. The sophisticated combination of different materials and colors highlight the detailing around the hinges. This matches the stitching on the front section, while the brand’s logo is laser-engraved into the temples. The men’s model is available in Black/Acid Green, Brown/Orange and Light Brown/Blue. The geometric design of these acetate optical frames gives a sophisticated and rectangular shape, providing the perfect backdrop for the color-contrast Paisley pattern on the front section. This colorful design marries with the solid-color temples, featuring the Etro logo positioned discreetly on the left temple. One of the stand-out models from the brand’s latest advertising campaign. Available in Black Paisley, Brown Paisley, Turtledove Paisley and Bordeaux Paisley. Appearing in the new advertising campaign, these men’s optical frames feature a rounded front section. The iconic Paisley design is engraved into the metal sections on the inside of the temples, while gold details on the front bring a glimmer of shine to the acetate base. The metal Etro logo is positioned on the left-hand temple. Available in Black, Havana Vintage and Streaked Honey.